Urban sprawl threatens the financial future of HRM and negatively impacts the quality of life of our residents. But HRM isn’t following its own plan to prevent it. We can do better. “Urban Sprawl is low density, automobile dependent development beyond the edge of service and employment areas” (Policy Almanac). I’m against sprawl. That doesn’t mean I’m against development or rural communities. I want to see those communities grow as towns and villages – not as rural tract housing in a suburban model. In the 60s, 70s and 80s, metro Halifax and Dartmouth overbuilt our road network, anticipating growth that was slow to materialize. Pre-amalgamation competition encouraged suburbs. They were small and manageable at first – like Fairview or Woodlawn. The underused roads kept commuting time down, allowing people to build farther and farther out. 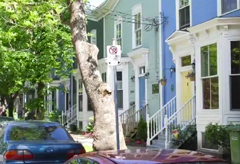 HRM actually recognizes that we need to focus growth on key areas to build up density. And not just in the core of the city, but also in other regional centres like Hubley Centre and Fall River. The regional plan lays out areas to focus growth over the next 25 years. It reserves areas for forestry, agriculture, and urban reserve; land we won’t need to look at for a generation. Unfortunately, HRM isn’t good at following its own plans. One recent example is the expansion of the subdivision in Grand Lake. It fails on two fronts: Grand Lake isn’t a regional centre and at one home every 2.5 acres, it isn’t exactly dense. Another example is Clayton Developments’ proposal to build in the Williams Lake backlands. The whole area is designated Urban Reserve. We don’t need this development. We already have Bedford South, West, Russell Lake, and others that are currently under development. HRM already plans to extend services, expand transit and roads, create parks and build rec centres to accommodate 30,000 more people over 15 years. Many local residents don’t want this development. They’re up in arms against the extension of city water to the area. They worry they’ll be charged per foot of frontage fees to extend a service they don’t want or need. They figure the developer will need this water supply for that huge property. To grow HRM sustainably, we need to start following our own plan. We will need new neighbourhoods. I believe they should be densely populated, mixed use, with houses and some apartments, easy to get around on foot and connected to each other by public transit. We need to make sure the real cost of development is charged to the home builders, so taxpayers don’t get stuck with the bill for new rec centres, fire halls and police cars required to service sprawling suburban developments. Sprawl isn’t inevitable. If we just follow our own plan and use common sense, we can avoid it. Like a conscientious gardener, we must plan ahead and grow carefully.